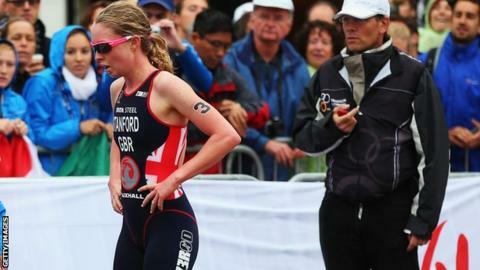 Triathlon world champion and Wales medal hope Non Stanford will miss the 2014 Commonwealth Games because of a stress fracture in her left ankle. The 25-year-old first injured her left foot in March and was unable to defend the ITU World Championships title she won in 2013. "I'm pretty devastated," Stanford told the BBC, adding the stress fracture was related to the foot injury. Carol Bridge a 29-year-old accident and emergency nurse comes in. Stanford was for Glasgow and now hopes to bounce back by qualifying for the 2016 Olympics in Rio de Janeiro. The squad already announced for the event included 2011 world champion Helen Jenkins and 23-year-old Holly Lawrence, who was preferred to double Ironman world champion Leanda Cave. However, Cave has again been overlooked again in favour of Rhondda Tri club's Bridge, who also competes in middle distance events. Talking about her own preparations, Stanford added: "I was really optimistic and everything was going really well. We had plenty of time to make sure I was ready. "So to take a second blow so quickly has been pretty tough, but unfortunately it's part of the game that we play. "Injuries happen to everyone and the timing has not been ideal for me. But I had such a fantastic year last year, maybe it would have been greedy of me to have another good one this year. Stanford said she was in "really good shape" before the fresh injury blow became apparent. "About nearly two weeks ago, I started getting a pain in my ankle. I got the doctor to scan it and, unfortunately, it showed up a stress reaction in my navicular, which is one of the bones in your ankle. "So I'm back in a boot and back on crutches and this week I had to make the really difficult decision that I wouldn't be able to race in Glasgow." When Stanford pulled out of the start of the ITU series in March, she was confident her Games preparations would not be hindered. But she admitted to BBC Wales in early June that she was still hampered by injury and her running was limited. It was an injury problem that first resulted in Stanford picking up triathlon. She was a successful junior distance runner before a period of rehabilitation led her to take up swimming, and consequently join the University of Birmingham's triathlon club. Stanford was crowned Under-23 World Champion in Auckland in 2012 and year later won the world title to become only the second woman to achieve those triumphs in successive years.